Obama: Government shutdown over Planned Parenthood "not good sense"
WASHINGTON --President Barack Obama urged Congress on Wednesday to avoid another contentious budget showdown and warned that the economy would surely take a hit if the government shuts down again. Mr. Obama blamed Republicans for the shutdown two years ago and made clear he would so again if it comes to that. "You'll recall two years ago Republicans shut down the government because they didn't like Obamacare. Today, some are suggesting the government should be shut down because they don't like Planned Parenthood," The president said. "That's not good sense, and it's not good business." A partial shutdown will occur Oct. 1 unless lawmakers provide money to keep the federal government functioning. The GOP-led Congress must overcome opposition from some conservatives who want to block federal funding for Planned Parenthood as part of a spending agreement. "The notion we play chicken with a $18 trillion economy...all because of an issue around a woman's health provider that receives less than 20 cents out of every 1,000 dollars in the federal budget -- that's not good policy making," the president said Wednesday. 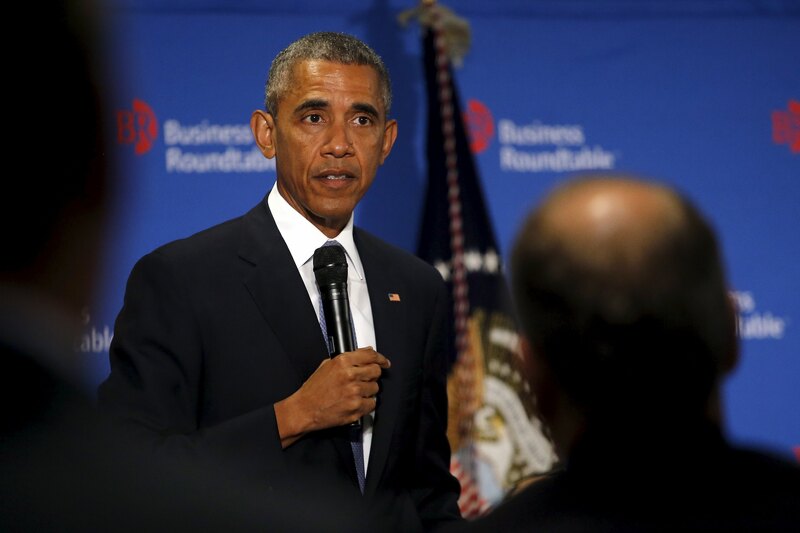 Mr. Obama used his speech to members of the Business Roundtable to turn up the pressure on lawmakers to reach a budget agreement. He also pointed to a potential revenue source to pay for some of the increased investments he wants in infrastructure, education and scientific research - taxing so-called "carried interest" as ordinary income rather than as a capital gain, which is taxed at a lower rate. The proposed change is aimed primarily at managers of some types of private investment funds who pay a lower tax rate on their income than do many individuals. He noted, without naming them, that some Republican presidential candidates, primarily Donald Trump and Jeb Bush, have voiced support for increasing taxes on carried interest. "You've got two leading candidates on the Republican side who've said we should eliminate the carried-interest loophole," he said. "Keeping this tax loophole, which leads to folks who are doing really well paying lower rates than their secretaries, is not in any demonstrable way improving for our economy." "If we close the tax loophole, we could double the number of workers in America's job-training programs, we could help another 4 million more students afford college," the president explained. This approach "is an example of how we can maintain fiscal responsibility while at the same time making the investments that we need to grow," he later added. Mr. Obama also tried to portray an improving economy that has come a long way while he's been in office. "America's winning right now. America's great right now. We can do even better," he said Wednesday. Trump: "Hedge fund guys are getting away with murder"
He argued the U.S. is doing better than those countries who have embraced spending cuts to climb their way out of tough economic times and that "perennial gloom and doom" descriptions are perpetuated by the presidential campaign that will determine his successor. "In the echo chamber that is presidential politics, everything is dark and everything is terrible," the president said. "They don't seem to offer many solutions for the disasters that they perceive." The Business Roundtable is made up of CEOs from large corporations. Executives from companies such as Procter & Gamble, AES, AT&T and Ameriprise were among those in attendance. The group released a survey this week showing that business executives are cautious about the U.S. economy's near-term prospects. The group is worried about a potential standoff regarding the budget, and further down the road, raising the debt ceiling. "Predictability is critical to spur investment and unlock economic expansion and job growth," said Randall Stephenson, chairman of the trade group and CEO of AT&T Inc. Stephenson added that "U.S. workers cannot afford the instability that comes with inaction."